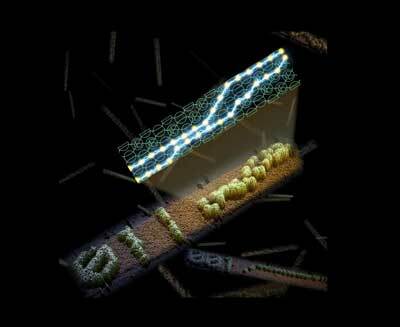 (Nanowerk News) Computer scientists at University of California, Davis, Maynooth University in Ireland and the California Institute of Technology have created DNA molecules that can self-assemble into patterns essentially by running their own program. The work is published in the journal Nature ("Diverse and robust molecular algorithms using reprogrammable DNA self-assembly"). Working initially as postdoctoral scholars with Professor Erik Winfree at Caltech, Doty and co-lead author Damien Woods, now at Maynooth University, designed a library of short pieces, or tiles, of DNA. Each DNA tile consists of 42 bases (A, C, G or T) arranged in four domains of 10-11 bases. Each domain can represent a 1 or 0 and can stick to some of the domains on other tiles. No two tiles are a complete match. Two of the four domains on each tile are "input," and two "output." In an electronic diode, transistor or logic gate, a value of 0 or 1 at the input (or inputs) will give a known value at the output. Similarly, depending on which tiles the researchers selected to begin their program, they could get a known output at the other end. It's rather like having a set of Lego bricks, some of which will spontaneously stick to other bricks. Select a set of bricks to start with, mix them together and watch them self-assemble into a structure. Doty and Woods began the work as theoretical computer scientists, so they had to master some "wet lab" skills. In the future, molecular programming might operate at a higher level, Winfree said. Today's coders don't need to understand transistor physics, for example. At UC Davis, Doty is now working on theoretical aspects of molecular programming. DNA is of special interest because it both represents information in molecular form, and it is relatively easy to work with, he said. "It's a great gift the molecular biologists have given us computer scientists," he said.